Amazon is having another shot at a QVC-style shopping channel that it hopes will gently persuade you into reaching for your credit card to make even more purchases from the ecommerce giant. 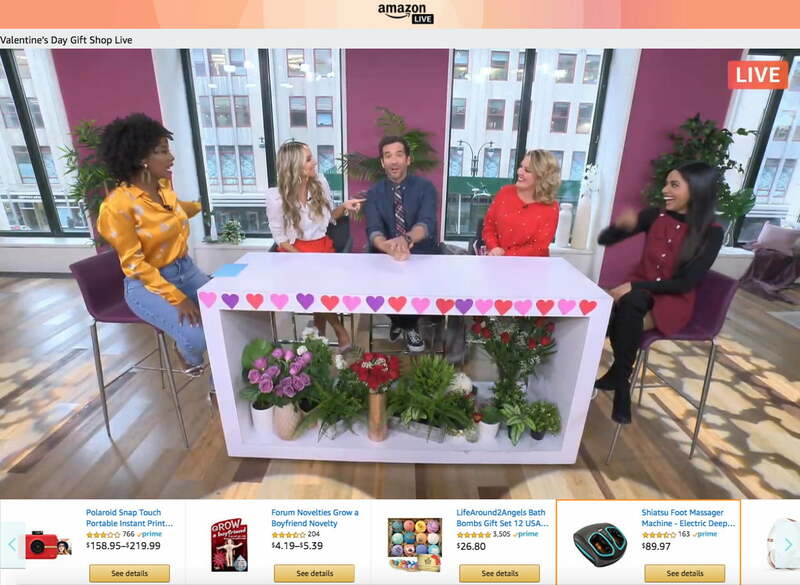 Amazon Live, which recently launched with little-to-no fanfare, is a mixture of slick, Amazon-produced live shows featuring guests touting a range of items related to a particular theme — for example, the Valentine’s Day Gift Shop show — and not so slick presentations made by product creators themselves. Recent efforts feature Truegrid’s Permeable Pavers and beauty goods from Grace & Stella. Immediately beneath the Amazon Live video player you’ll find a carousel (shown above) with links to the product pages of all the items that appear in the show, enabling you to make a purchase in just a few clicks. As the show proceeds and guests move their way through different products, the carousel automatically moves along to highlight the particular item they’re talking about. There’s also the opportunity for presenters to chat and interact directly with viewers as they present a live stream. Further down the page, below the carousel, are all the shows that have already streamed on the channel, so you can dip in and watch anything that strikes your fancy. With so much content competing for our attention these days, it’s questionable whether Amazon will be able to attract enough eyeballs to its new shopping channel in order to make it a success. Besides competitors like QVC, it also goes up against the plethora of exceptionally well-produced videos on YouTube by reviewers offering independent and considered opinions on every product under the sun. But for ultra-enthusiastic consumers who like to shop from the sofa, the offering certainly provides yet another avenue for finding stuff to buy. As noted by TechCrunch, which first spotted the channel, Amazon Live isn’t yet showing on Amazon’s main website, possibly because it wants to tweak the channel’s output and design before giving it greater prominence. The online shopping giant has also launched Amazon Live Creator, an app currently for iOS that helps brands with their own interactive shows for live-streaming on Amazon.com on desktop and mobile, as well as on Amazon’s mobile app. This isn’t the first time Amazon has tried to make a success of an online shopping channel. Back in 2016 it launched Style Code Live comprising fashion- and beauty-focused shows, but just over a year later the company pulled it. We’ll have to wait and see if it can make a better go of the format the second time around.